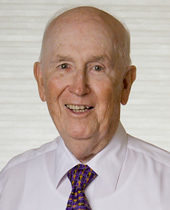 In 2002, at the age of 79, John Flatley took over ownership and management of the company that had employed him for 55 years. John quickly streamlined operations and enhanced profitability at the Otis McAllister Export Company. Now 84, John even moved company headquarters from downtown New Orleans to his apartment in an assisted living facility in Algiers. A true businessman, no one would accuse John Flatley of corporate extravagance. Since taking control of Otis McAllister, an export business specializing in pest control and agricultural supplies, John has attracted new clients and entered new markets. He recently expanded his international client base in Mexico, and the government of New Zealand is now his largest customer. Business has been so good that John’s daughter Judith retired from teaching this year to help manage the millions in sales that now flow through the company. Sixty years in the export business has earned John Flatley the trust and respect of his many clients, who frequently send him new customers. Manufacturers, attracted by his outgoing personality and impeccable reputation, solicit John to represent their products. At the same time, John is eager to learn and adapt. He now uses a computer for the business but don’t try to take away his typewriter…he still uses that for billing. A lifetime of practice — and patience — can pave the way to great success. It certainly has for John Flatley, who exemplifies excellence through experience. John approaches each day as a learning experience — an opportunity to broaden his business knowledge and enhance his client relationships. An ongoing quest to learn and to grow. This is John Flatley… Peoples Health Champion.